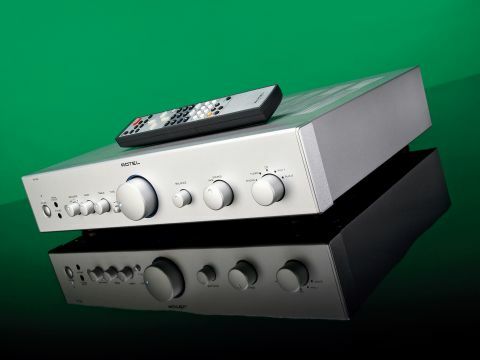 Rotel currently offers a range of amplifiers and receivers to suit most hi-fi and home cinema applications, plus audio source components and DVD players. It has an admirable habit of not fiddling unnecessarily with good products, but every now and then new models come along and the RA-06 is one of those - in fact, there's a whole 06 series of recently-launched hi-fi separates. Externally it's familiar Rotel stuff, with a smart rather than beautiful front panel fronting a slimline case. The line-up of five line inputs with an additional moving-magnet phono stage is also unsurprising, though one of the inputs appears on the front panel as a 'media player' mini-jack socket. In its promotional material, Rotel makes much of its 'Balanced Design Concept', by which it evidently means attention to detail. Of course, most manufacturers claim as much but there's plenty of evidence here that Rotel's boast is not empty. Looking inside the unit, we were impressed by the percentage of really good quality electronic components, such as close-tolerance, low-noise resistors and polypropylene film capacitors, the sort of stuff normally found in more high-end equipment. Not everything is quite so fancy, but the power supply uses a fair-size toroidal transformer and the output stage is generously equipped with doubled pairs of transistors. The rating of 70 watts per channel is around average these days for a mid-price integrated and will drive most speakers to more than satisfactory levels. If there's one thing that stands out from our listeners' notes on this amplifier, it's that the sound is generalised and lacking in refinement. It seems to be good at lots of things but very good at few. The best feature is probably rhythm and pace, which attracted consistently favourable comment and gives an appealingly funky character to any music with a strong rhythmic underlay. We wouldn't dream of demanding total control from an amplifier at this sort of price, but others in this group achieve a better approximation to 'grip' than the Rotel. Bass is extended but lacks real precision and so varies considerably from one track to the next. Synthesised deep bass sounds are probably best served, but jazz-style plucked upright bass proves a tricky problem with a 'woofy' quality to it. In busy tracks, bass seems to recede somewhat, a characteristic our panel found most apparent in the Michael Jackson excerpt. At higher frequencies, there's something of a tonal issue in the way instruments are portrayed. In many of the tracks we tried there is a lift in the higher midrange or 'presence' region, yet upper treble is suppressed and hence instrumental timbre is less clearly defined. This also has an impact on stereo imaging, which is broad but again vague. All the same, this may be to some extent missing the point. Our listeners still enjoyed this amp, even while criticising certain aspects of its performance, and after they'd gone we found it a definite 'grower', a bit of a cheeky imp that's distinctly biased towards fun rather than analysis. We can't give it an unqualified recommendation, but we left it with feelings of affection. This well-behaved amplifier gives no obvious cause for concern in its measured performance. Rotel is keen on extended treble bandwidth and that's certainly in evidence here, with a high frequency -1dB point of 180kHz, a full three octaves above audio and more than enough to accommodate any current or proposed high-definition digital recording system. The bass isn't as spectacular, but still adds nearly two octaves to audio's 20Hz notional limit. The phono input nearly matches these figures, despite a slight boost below 100Hz. In terms of power, there's a good 1dB of headroom above the notional spec, and into a 4-ohm load dynamic power exceeds 170W. This is aided, no doubt, by the doubled output transistors. Distortion is good and holds up well at high frequencies, exhibiting just a touch of mains modulation in the extreme treble. There's a trace of phase modulation, but nothing likely to be serious.